You are here: Home > All Smartphones Free Today And Tomorrow!! 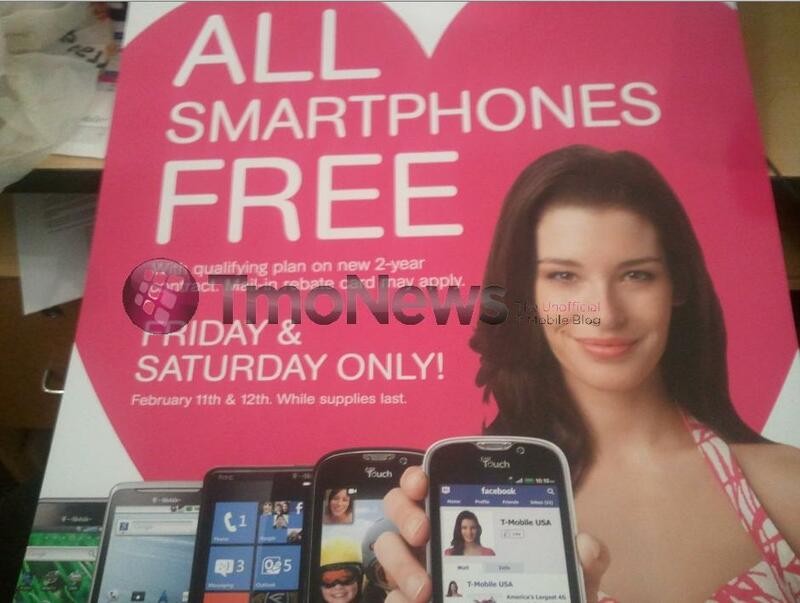 All Smartphones Free Today And Tomorrow!! Today and tomorrow only, T-Mobile is hosting their “All Smartphones Free” sale for new customers and qualifying upgrades!! Put the family in the minivan and head on over to your nearest T-Mobile store and take advantage of this awesome offer! P.S. Some phones require the rebate amount at the time of purchase, though you’ll get that back and then it’s really free! P.P.S. Miami peoples in Dade County, no rebates required for you as the county nixes them! P.P.P.S. You can watch the Khloe Kardashian video promotional video for this great offer, but we urge you to do it after you take advantage of the offer itself. You’ll need some time after watching this to recover. Does this include Nexus S? No, as it’s not sold in a T-Mobile channel, only Best Buy. I called T-Mobile and was able to get the My Touch 4G for free w/out having to deal with the mail in rebate. What did you say to get loyalty to waive the rebates? Are you on the unlimited data or the $10 data plan? I just asked if I was eligible for the free phone. I signed up for the unlimited data plan. You should know however that by calling in, this will not and mostly likely won’t aopply to everyone, so stating what you just did is irrelevant. Because you were able to do something, does not mean the next person will be able to do the same thing. I would recommend that people just log in to their my tmobile acct, click on upgrade phone, and see what theyqualify for. Calling customer care jsut to see where your upgrade status is, is a waste of time, and also one reason why so many customers like myself who may really need assistance, have to wait on hold for so long. I assume they are trying to get rid of inventory for the several new phones coming out soon? Of course T-Mobile is always trying to get rid of inventory and Yede1, this is the wireless industry. There will always be something coming out that is the “Next best thing”. Folks, check your eligibility before going to the store by calling customer care. Also, if you had upgraded in the last 22 mos and returned the device in your buyer’s remorse period make sure that the tenure reflects that you are at or beyond 22 mos or the store will not be able to help you! Save your time and energy (and customer care’s) by being prepared! Or you can check at my.t-mobile.com. Also keep in mind that if your account is past due you likely won’t be able to do it so make sure your account is current! I’m holding off for those nice upcoming phone!!! Nice deal but I’m not interested in The unlimited data! does this require the 25$ data plan or can we get this deal with the 10$ one? Any one knows in what cities T-Mobile’s HSPA and HSPA+ is available???? Try the coverage locator on T-Mobile.com? iPhone only, limited time offer. Verizon says they will not be offering unlimited soon…. Bob is not saying he can’t afford a phone, he is saying what every wise journalist on the Net has been saying over the past year, don’t get sucked into an attractive subsidized price for a phone, you have to look at the true cost of the phone, which is the cost of talk and data for the next two years. The carriers are no different than the printer manufacturers, for example. By now, of course, people are catching on as to why manufacturers sell what used to be $500 printers for $100. It’s because they get you on the ink refills (very few people shop on eBay for refills, they walk into Staples and pay $50 for a four cartridge set. And many people do that once a month. So the actual cost of the printer is more like $600 a year, not the $100 one paid for the printer). And what else Bob is implicitly saying is that one is locking himself in to a two year contract to pay $30 for data. That benefits the carrier, not the end user. The people who understand the concept of locking one’s self into a two year deal like that are the old timers, those of us paying $15 to $20 for unlimited data. AFAIK those people are not in any rush to get an additional line/phone, at least not at these prices. As I said in my post that was torn down by TMoNews, people really need to think about the total cost of these phones, not just the word “free” upfront. Sidenote: This is a good deal, however, if you get the most expensive phone T-Mobile has. That’s because if you amortize the $500 to $600 you didn’t pay over the two year contract, that’s like getting data for $20 to $25 monthly. @ its michaelnotnike, you trying to over think it! That’s not the best way to look at this scenario, bc what trumps what you are saying is the mere fact that every big carrier is primarily doing the same thing. REQUIRING data. What would make sense, to your defense, is if someone were to buy the phone in at full price to avoid the contract. Btw, if you have a grandfathered plan, I highly doubt tmobile would make you go higher data wise. At least I have not had to do such thing. So all this breaks down into one logical explanation of choices. As a customer, do not worry about a retail price of a phone is you are getting a discount. We not negotiating cars here. Secondly, if you want a smartphone, then you will need to conform to the policies listed for data or don’t get a smartphone, that simple. Having been buying phones when they cost $500, where its only “feature” was that it was the smallest in the world (Motorola Vader, Star Tac) this is one person who is not concerned about buying phones. Matter of fact, in my house it’s the one thing I kind of go nuts on. I keep my notebooks and desktops for years, but I love buying phones (I still have about 50 of them in my “cell phone museum” aka boxes in the basement). That said, read anywhere on the Net, (Wall Street Journal, Fortune, Forbes, etc.) they all are saying the same thing. People in the past have failed to look at the total cost of a phone, mainly because of discount come-ons and being able to pay that $1500+ in small monthly payments. But with the tanked economy people are looking where they have spent in excess and where they can cut. Yes, every carrier is now requiring data plans with phones, but that’s a fairly new industry-wide gimmick because people were buying phones and not getting data. So now carriers are coming out with ways to force data on people, you want the super phone you have to pay for data. As I said elsewhere, data saved the carriers’ collective butts. And so did Facebook and Twitter. After all, those 500 million FB users all have to stay up-to-date on their friends’ uploads. Lastly, what I am discussing here is not grandfathered plans, it’s about new customers or those people who want to add a line. If adding a line, it’s at the new rates. You are right that if one upgrades a phone the old plan is grandfathered in. But I see that ending by next year. I opined a year or so ago that eventually, by 2012 I predicted, T-Mobile will do away with all unlimited plans (unless one is willing to pay $100 for it) and go the way of AT&T. The money is simply too tempting for T-Mobile to remain the genuine value carrier that it is. Regardless of what we think, T-Mobile’s shareholders and investors are going to insist that TMOUS move to tiered data pricing. When that happens our grandfathers are going to be buried six feet under. IMHO these free phone promotions are a big hit because it allows people to get a phone that they otherwise could not afford. (I know people who make $150,000 a year and will not buy phones because they have time left on their contracts and cannot afford to buy even a $200 handset, much less a $500 superphone). I ordered a phone on t-mobile.com and they didn’t even tel me I needed a data plan. Does the free phone offer apply to the BB bold? Free phone means free phone. EVERY SINGLE PHONE TMOBILE HAS is free. Will need to check the rebate status however as there may be a slight rebate depending on the phone tm71. But no biggie at all, bc you will get that back. Make sure to ask the retail rep to get you a rebat form and fill it out before you even leave the parking lot!! Remeber to make copies of what you must send in for your records! Thanks. The reason I asked is because the ad says all “Smartphones” and BB Bold does not show up when I select “Smartphones” on tmobile.com. I’ll go to the store to check this out. will i still be able to get a free phone if i can call CS? i’d rather have a $200 nexus s with a $10/month plan than one of these and be forced into $30/month. Most everyplace I spend a lot of time has wi-fi, so really no point for the 5g/unlimited. $30*24months=$720. $10*24months+200=$440, so if my math is right and I don’t need 3g use, nexus s is much cheaper and a better phone. Can u expand your memory with a bigger SD card on the Nexus S? -No. The Nexus S does NOT have an SD slot. Does the Nexus S have a 768MB of RAM like the myTouch4G? -No, Nexus S only has 512MB. Is the Nexus S 4H (HSPA+) like the myTouch 4G? -No. The Nexus S is a 3G phone. Ok I think I won’t be getting Nexus S.
lmao ur crazy. lets see which phone will get updated sooner!! lol! and ur only comparing the parts in which the mt4g wins. what about the internal storage?? Nexus s wins. Which screen is nicer??? nexus s wins. shall i continue?? ummmm….xda for the win. my phone will always have the latest version of android. I’m sorry but Nexus S is a fail… It does nothing different and looks no better than my rooted Vibrant running Nero V5(I switch between this and my HD7). Oh I can expand my memory. Samsung had an opportunity to change the game with the S and they failed… The Nexus 1 is still a better looking phone to me with a better feel. The Nexus S even looks cheap next to a Vibrant. Rolling On The Floor Peeing My Pants! funny because i have mytouch 4g, and i used 800mb just in this month (feb) only. and i have wifi everywheree too. good luck with that $10. need to understand that people uses their phone differently, just because you uses alot of data on your phone, doesn’t mean everyone and their momma does the same. that hspa is a data sucker. when i had my g2, just in the span of three days i was close to 200 mb of usage. March 17th makes a year since my last upgrade do I qualify!!!?????? (((( I have the Motorola Cliq XT right now )))) MY FINGERS R CROSSED!!! Ok…..=( thanx. Do u work for T-Mobile? If so, what do u think I could get since the Cliq XT isnt gonna be updated?? don’t take advantage of the loyalty department. They only make better offers beyond what general care can give you due to the fact that they want to retain you. So don’t call and just threaten to cancel just so you can get yourself a better deal. @needanewphone you’re not gonna get a very big discount at all if it’s only been 12 months. You’re only going to save about 50 bucks. Just ordered my HTC HD7 will be here overnight!! Is it worth giving up my grandfathered $5.99 tzones to upgrade and take advantage of this? Been holding out for some time on jumping to Android… but with the hack now virtually gone, seems inevitable that I need to upgrade. Only other option I see is to buy a Nexus One used, or a BB full price to keep the $5.99 plan in place. Wont give up my $50 unlmited loyalty unlimited calling or $10 unlimited texts thouigh. Thoughts anyone???? lol tzones?! is that like wicked slow internet? Exactly how is it the same? Even with your welfare hack you only get Edge speed. Your best bet is to keep your food stamp net price and get a used smartphone and steal your neighbors wifi. Bad deal for anyone who already has <$30/mo unlimited data and wants one of the phones that requires $30/mo data plan. if you already have the unlimited $30 web then its probably to early for you to upgrade anyway. If you have the $35 (older unlim web/txt) plan then u could potentially save some money. As long as u either have unlimited web or get unlimited web then u can use this promo. ooops…. forgot to mention. I would be looking at getting the G2 or the MT4G. Also, customer service said i have to get the $30 plan, but can change to $10 once the rebate is completed. Any truth to this? Yes, the MiR requires the $30 web for some devices, but once the MiR is accepted there is nothing stopping you from switching the data plan. except the rep gets screwed out of his/her hard earned commission! Checked my online status for upgrade as I am at 24 months. best price for any smartphone is $99 bucks. Do TMO screws legacy customers again? The online offer is different than what the retail store is offering. Wow, you mean customer loyalty does mean something? TMO has been negative with me at 21months on the last deal where I was one day outside the free G2 deal. I have also tried to get them to lower the 149 pricing on the G2 after that and they wouldn’t budge. Maybe I am just getting stubborn reps. But they really don’t have 4g and everyone paying the $30 data plans is just subsidizing it. Sprint does the same thing G2. I called customer service, said “cancel” at the computer prompt to get transferred to the retention department, noted the in store deal and the fact that I’m an existing TMO customer who lives 2 hours from the nearest store. I then asked them to match the in store price and they did so without batting an eye. HD7 on the way for free. No they dont, just go to the store and upgrade there, I got 4 my touch 4g’s !! Free!!!! You’re not getting screwed… the promo is in store only. Go there and you’re golden. 1) T-Mobile always runs some kind of special in response to iPhone debuts. It must work because T-Mobile keeps doing it . 2) MWC is happening. All the new phones will be announced. Contracts for holiday 2011 phones will be signed. So it’s time to get rid of old inventory and also lock people in to two year contracts with the old phones. This assures that come the holiday season the dual-core phones, for example, will attract new customers. Those buying now will in November have to buy an additional line, pay full retail, or stay put. The adventurous can do what I and some others do, sell our handsets and wait on the fence to see what washes up on the shores of online tech. I just sold my Vibrant and am making do with my HD2. (And have a G1 and Pearl 8120 if I sell the HD2). It’s going to be a fun 8 months, seeing all the great stuff coming out (including the hybrid tablet/netbooks debuting in a few months). All that said, I might cave and BUY a Samsung 4G phone (at full retail, because I don’t do two year contracts). 8 months is a really long time to sit and do nothing in terms of phone shopping. Don’t buy the samsung. The have some neat features but I gave up my Epic for an Evo and don’t regret it. I have had friends really laud old LG phones and think I will wait for the Optimus 2X. The 2x still has no verified US release date. Well, that’s the name of the phone game. There’s always going to be that newer and better phones. Before you know it you’ll find yourself in the same position come next year February, wishing to dump your Optimus 2x or whatever phone there is in the future. Maybe there will be slide outs with front facing cameras, Quad Core Processors, etc. But hey, that’s why there’s people like me selling phones 5 days a week! People want the latest and greatest! My sister and bro-in-law have finally jumped to smartphones via this promo. Both have MT4G’s now… and T-mo is having a promotion on its 3000 minute family plan. With unlimited text and data, it’s $149.99… with my dad’s dumbphone line, it’s $154.99. They were paying $110 a month for 1000 anytime minutes on three dumbphones and unlimited text before… pretty sweet deal for T-mo customers. And just to add to what Uansari1 mentioned, lets say that Uansari1 wanted unlimited web on that 3rd line, it’s only $20 instead of $30! That is a great great plan! just got back form the t-mobile store – my husband and I got a myTouch 4G (him) and a G2 (me)! rebates stick especially that they put it on a VISA card but oh well! can’t beat FREE! Are you joking, i can’t help getting one as a Valentine’s Day Gift. According to tmonews, t-mobile’s 3g network is faster than verizon which has a good coverage. BTW, this news is best than ifunia’s gift idea, because it’s free. I’ll wait…the HTC Pyramid is coming out this summer. It hasn’t been confirmed for T-Mobile USA. We’ll find out this week with MWC…I like what the sources are saying. I’m sure it’ll be in T-Mobile’s line-up. I GOT A BB BOLD 9780 at Gilbert T-Mobile !! WHOOOO ! The peeps i know who went to take advantage of this deal just walked out after they found out they had to wait for a rebate. In this economy not many people can pop down 2 hunny and wait for it back. One of my peeps said that there was a huge line, and only 2 people walked out with phones because of the rebate. Better luck next time tmobile. I’m still loving my MyTouch 4g that I paid full price for. Worth every cent! Was hoping to get my gf a new G2 because she really likes the phone but had to walk away after asking for a $200 upfront and then rebate. No sorry, sir – no longer interested. Now, she can prob just jumped on the ifon wagon with Verizon.